Ideal to Remotely Install and Spy on All PC Activities. Here you will find common questions about our Realtime Spy software. Be sure to read our Realtime Spy legal policies. 1. 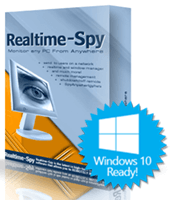 What versions of Windows is Realtime Spy compatible with? 2. Nothing happens when I run the RTS logging module! 3. I configured Realtime Spy, now how do I deploy the software remotely? 4. How long does Realtime Spy take to download? 5. Will users know Realtime Spy is installed when they run it? 7. Can others access my Realtime Spy logs? 8. Can I archive my Realtime Spy logs? 9. Will Realtime Spy work with ANY and ALL Internet connections? 10. My Realtime Spy webspace only contains a "Parent Directory"? 11. How do I change my Realtime Spy password? 12. How do I remove a user from my Realtime Spy webspace? 13. Can I install Realtime Spy with a floppy disk? 14. The software is not accepting my username/password? 15. My Logs do not seem to be updating anymore, how do I fix this? 16. The Administrative commands do not work? 17. The attachment I am sending is being rejected - what do I do? 18. Will my antivirus or antispyware software detect Realtime Spy? RTS is has been tested on, and is fully compatible with Windows NT/2000/XP/Vista. It is recommended you have all the latest service packs and security updates installed, however. 2. I tried running my the Realtime Spy application I configured, but nothing happens. Your antivirus software may have corrupted the file. Please ensure the file is around 100-115kb and try configuring a new monitoring file. You will need to distribute the Realtime Spy module you created while running the RTSConfig.exe application. This file you created is the file you will send and run on other PC's. For detailed e-mail and network deployment steps please refer to your product documentation that was installed with Realtime Spy. 4. How long does Realtime Spy take to download over a Network or via Email? Unlike other monitoring packages, Realtime Spy is VERY small in size (100-115KB) and will take only a few seconds via email(even on dialup) and only an instant over cable/network connections to download. Yes, Realtime Spy requires the user to run the file you send them. When they run it they will be told that monitoring software is being installed, with an option to cancel. To view your activity logs for Realtime Spy simply point your browser to http://www.Realtime Spy.com/username - where your username is replaced by the username you received after purchasing. You will be prompted for your username and password - enter these as given to you when you purchased RTS. Absolutely not! Every user has their own unique username and password that only THEY know. You must specify your username and password to login and view activity logs for your Realtime Spy software. Yes, you can use the included Realtime Spy archive utility to download logs from your webspace for future viewing and saving. Absolutely. Unlike other remote monitoring products, Realtime Spy does not care if the monitored PC is behind a hardware firewall or router, or if the PC is on a network, cable, or dialup connection. You will be able to ALWAYS access your logs via your webspace. No need for IP addresses, port numbers, or directly connecting to the remote PC! 10. My Realtime Spy webspace only contains a "Parent Directory" listing - no logs - what is wrong? Nothing is wrong - this just means you have not deployed Realtime Spy on a remote PC to monitor. Once you start monitoring a PC your logs and web interface will appear in your webspace! Please wait 15-20 minutes from when the file is first executed for the first sets of logs to appear. Simply use the form HERE to change your password. This password change will effect remotely deployed Realtime Spy modules - if you change your password they will not longer update your webspace with logs until you reconfigure their passwords. Simply use the form HERE to remove an unneeded logged user from your Realtime Spy webspace. Yes, just copy the Realtime Spy file you configured to a floppy. Then copy it from the floppy to the PC you want to install it on - then run the file. Make sure you are entering the username/password EXACTLY as given to you (the password and username are case sensitive). If this still does not work make sure you have no firewall blocking outgoing FTP traffic on port 21. First you should ensure that the software is still running on the remote PC. If it is not, then re-run the logging module you created to restart monitoring. Second, verify that you have not changed your password after creating and installing the module on the target computer. Changing your password will cause the remote module to be unable to access your log storage account. It is advised you first run the stop-rts.exe file on the remote PC (this file is in your :\program files\Realtime Spy folder) - once you run this, wait a minute or so - then re-execute the logging module you created on the remote PC - this will restart the monitoring. To use the admin commands you must be on the same network as the remote PC (if it is indeed on a network) - otherwise they will not work. Also make sure the remote PC is online at the time, since the admin commands use a direct connection to the remote PC. Some email clients/servers reject executable (.exe) attachments. To circumvent this you can zip up the .exe you created using a zip program (such as Winzip) and then send it. You can also place the .exe into a document file (just drag the .exe icon into the document and save it) and send it this way. Some antivirus or antispyware may interfere with Realtime Spy's installation and operation. If you experience an antivirus/antispyware conflict please contact our support desk so we can provide you with an exclusion list that you can manually enter into your antivirus software on the monitored computer. This will allow Realtime Spy and your antivirus/antispyware software to work together. Realtime-Spy receives many acclaimed reviews. Top Five Advisor called us the best remote monitoring software! See their Realtime-Spy Review.